Anyone ready for another renovation reveal? Slowly but surely, this little house is coming together, room by room, and while I wish I could hurry things along, life with a newborn is keeping our pace slow and steady. Before we launch into the second round of major renovations (so long garage, hello master suite! 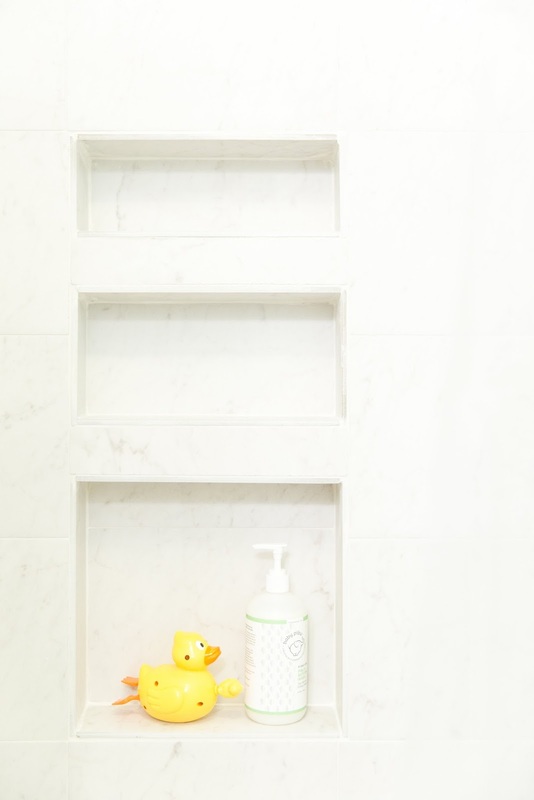 ), we decided to tackle the smallest project on our to do list: the children's/hall bath. This space turned out to be much more of a challenge than I ever imagined it could be. Because of the layout of our house, this bathroom serves as the current children's bath, guest bath and the hall bath. 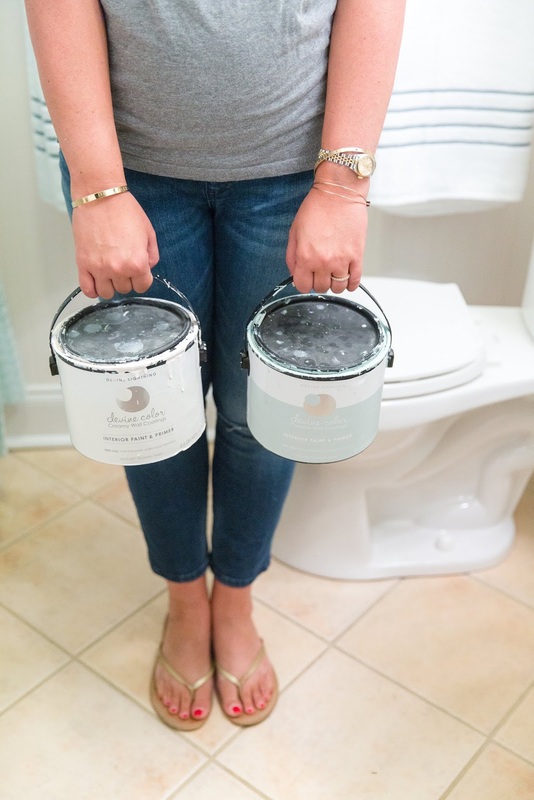 I won't lie, having our guests use our pre-schooler's bathroom is not exactly ideal, so I made it my mission to create a bathroom that was able to welcome guests while also meeting the needs of my three year old son. Sadly, the bathroom has no source of natural light and is too small for multiple light fixtures, so it was incredibly dark and dingy, making it look more dated than it actually was. To keep things interesting, we also decided that the layout of this house and our budget did not allow for any major upgrades to the space - no new flooring, vanity, lighting, toilet or tub. We did have to replace the plastic shower surround because it was separated from the tub, leaving some of the dry wall exposed and vulnerable to rot and mold. Oh, and did I mention that the bathroom is tiny? 5 1/2 feet long by 6 feet wide, tiny. In case you need a visual, one can sit on the toilet and touch the sink, door, tub and three of the four walls without stretching. It's honestly the smallest bathroom that I've ever seen a full sized tub squeezed into but that tub is the only one in the house currently, so we are grateful for it. I honestly love how bright and fresh the space looks - I really didn't know how much I could accomplish without completely ripping out the bulk of the bathroom and starting over, but I think we really met the challenges of this little space head on! 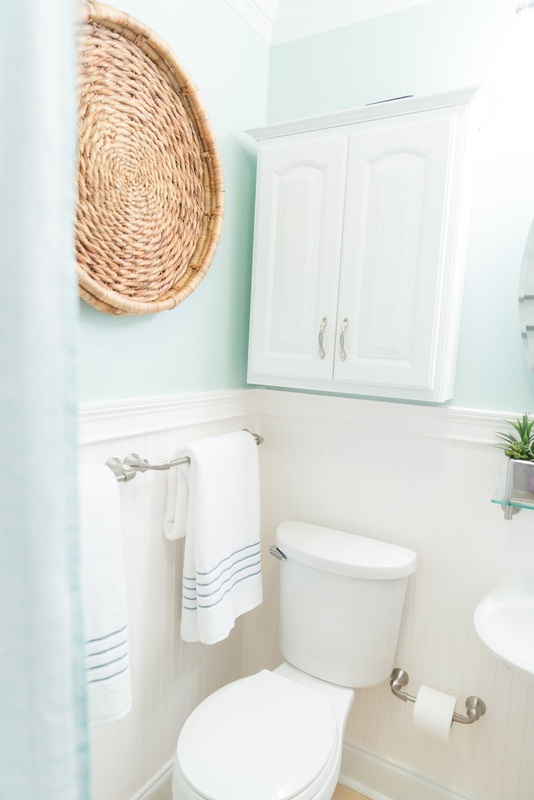 To make the space feel as large as possible, we ditched the dark brown color on the walls and went with fresh paint in a gorgeous shade of bright white, Devine Lightening, on the bead board and a soft shade of aqua, Devine Horizon, on the walls. Both colors are from the Devine Color + Target collection, which is exclusively available at Target (you can find it near the lightbulbs!). The paint is insanely easy to work with, applies and covers so well and comes in a huge variety of shades. Since we were working with two types of surfaces (dry wall and bead board), we really put our cans to the test, but I am in love with the results. In an attempt to maximize storage in any way that we could, we added two towel bars that hold all of our guest towels. I think Justin kinda thought I was nuts to fill that wall with towel bars but once they were in, he agreed that we needed the hanging space. I also snagged a bright yellow back of door hook for all of our currently-in-use bath towels (we prefer our bath towels to be animal themed around here!) from the dorm section of Target. I didn't want to put any permanent hooks in the door but the added hidden storage space behind the door has proven to be oh so needed. We kept the storage cabinet over the toilet and, while we replaced the hardware, we also kept the glass shelf over the sink. 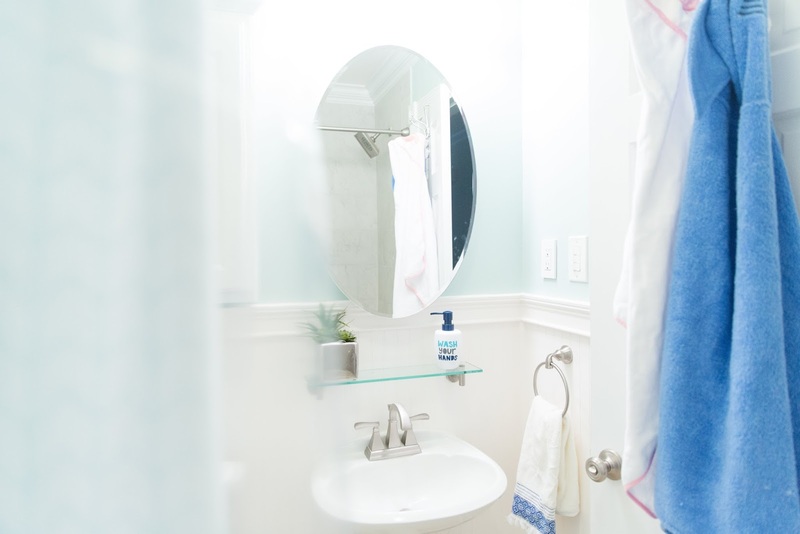 Thankfully, the mirror that was already in place is also a medicine cabinet, so that became home to all of the supplies we need on a regular basis and allows us to keep the shelf clear of tiny toddler toothbrushes in case we have a guest drop in. As I mentioned, we hadn't intended to replace any part of the shower/tub with the exception of the shower head but, unfortunately, the shower surround began to separate from the tub, creating a gap that allowed water to reach the dry wall behind the shower. Not good. 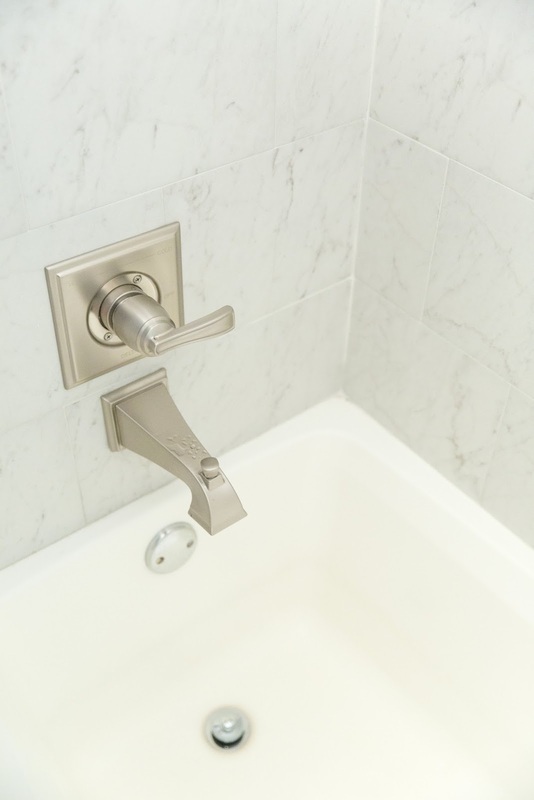 Luckily, we found a gorgeous, inexpensive tile option that has the look of marble and added a high end feel to what was previously a dingy tub area. I was able to take advantage of the need for new tile and create an oversized shower niche for storage. 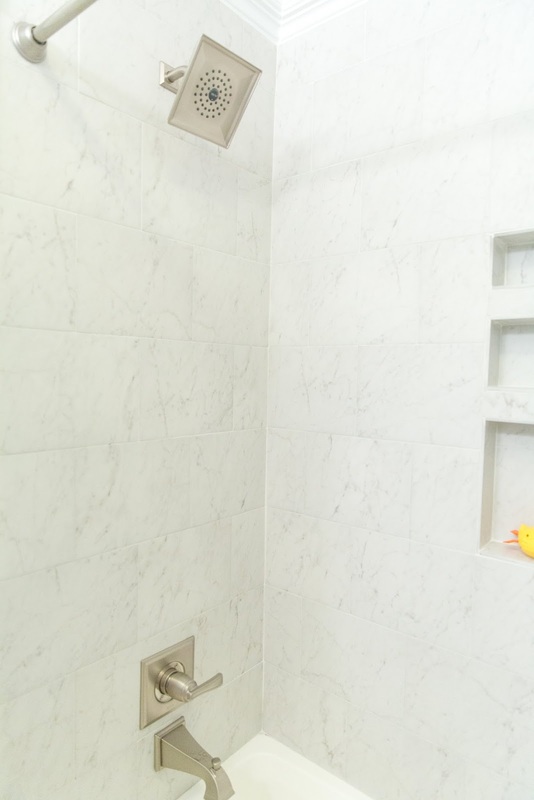 Since the tiny bathroom is majorly lacking storage, I wanted a spot where I could stash as many bath products as possible and my contractor created the nook of my dreams. To make the space look more current, we replaced all of the hardware with brushed nickel fixtures that were in stock at our local hardware store. This was another element of the design that came about thanks to the need for new tile and I was happy to replace the old, handheld shower head and mismatched hardware for something more our style. When it comes to renovations, styling the space is absolutely my favorite part because you (finally) get to see all of your hard work come together. 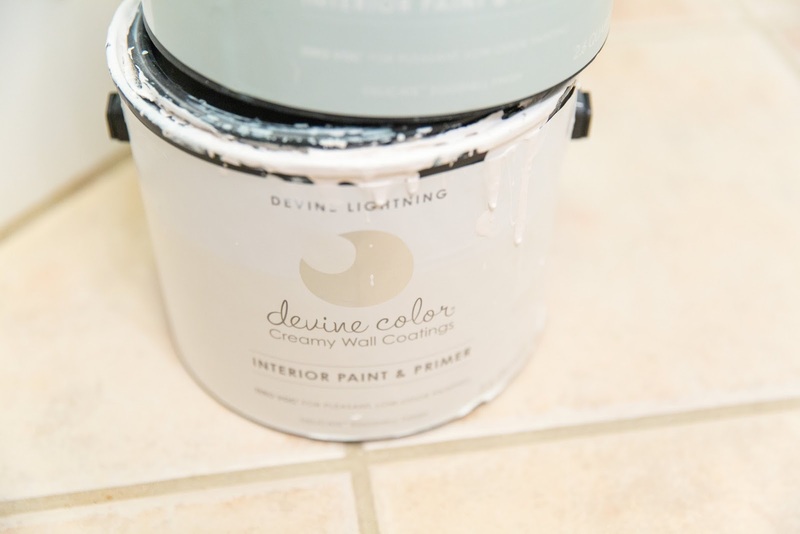 After choosing the shades of Devine Paint and seeing them on the walls, I knew where the color scheme was going but wasn't sure how I was going to add any sort of decor to such a small space. On one of my weekly daily Target runs, I swung through the home section and found a pair of super plush towels with just the perfect stripe to bring out the wall color. 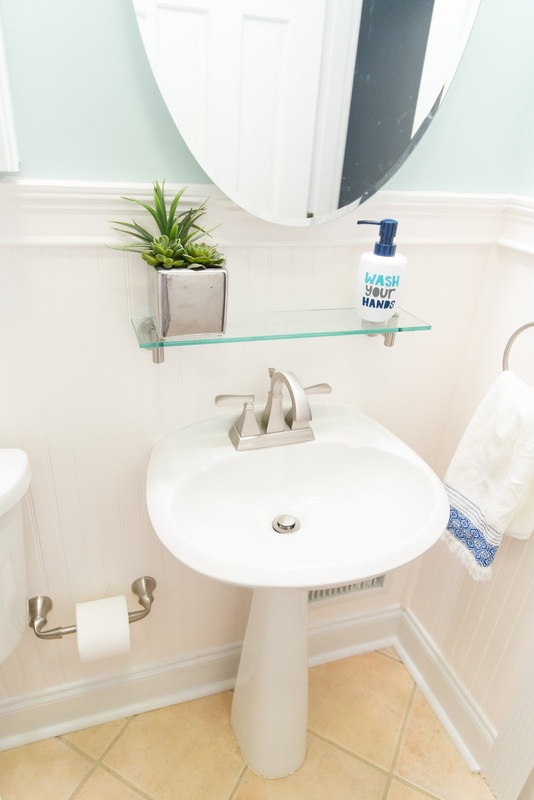 After that, I was off and running - I chose a mix of what I consider kid friendly and more sophisticated decor with the combo of the adorable "wash your hands" soap dispenser (from the Target kid's bath section!) and the geo patterned shower curtain. Obviously, matching the colors of my Devine Paints and the accessories from Target was the easiest ever because Target gets me, simple as that. The woven tray is also a Target find and you may recognize it! She used to hold court as my coffee cup holder on my bed, but I think she looks perfect as the focal point on the only open wall space. And that's all she wrote for this little project! What do you think? Isn't it amazing what an impact fresh paint and new hardware can make? Next up, we tackle the biggest part of our renovation and we'll be living in the house while we do it....here's hoping we survive it! P.S. 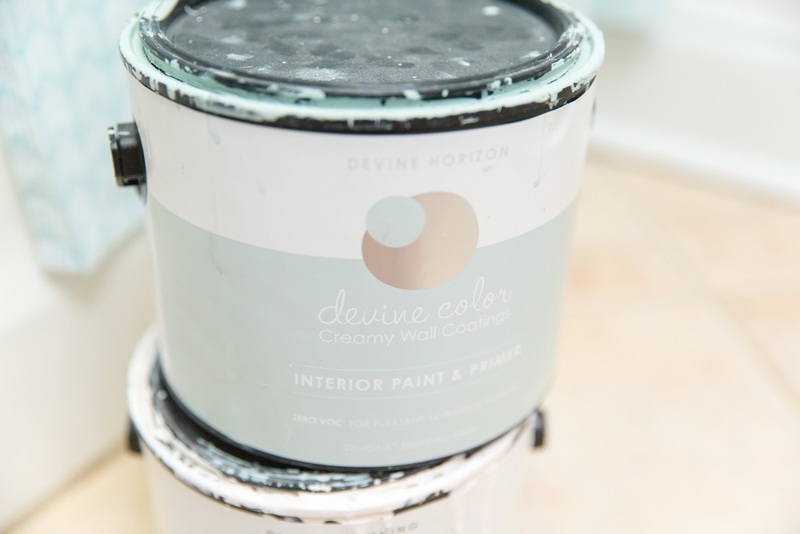 Don't forget to check out Devine Color on Instagram for more projects, design ideas and paint colors! Girl you did SO good on this space!! Love love love the color and how bright the room looks now! Was there a surround piece around your tub that you removed? If so, would love to know how you removed and replaced with tile. We would love to do this with ours, but we weren't sure it was possible.